The great blue herons are putting on their breeding plumage. They glow against the dark rocks of the riprap. 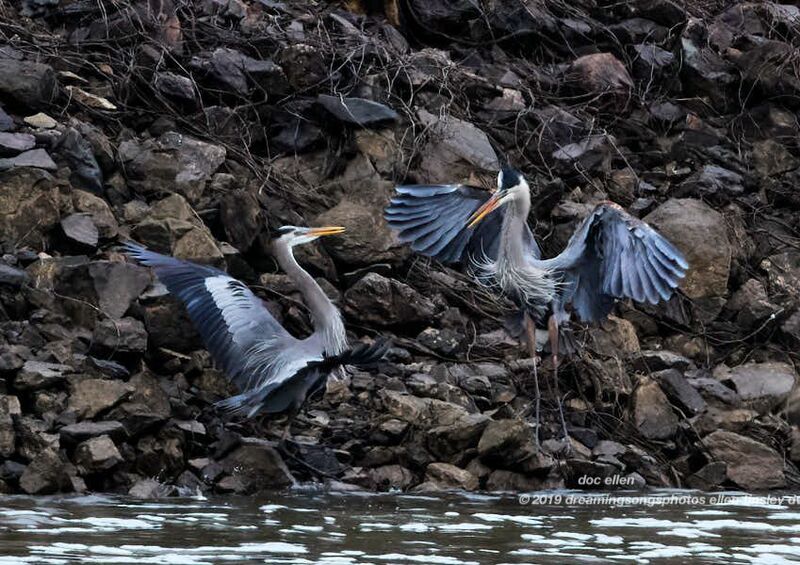 Great blue herons often argue and chase one another. 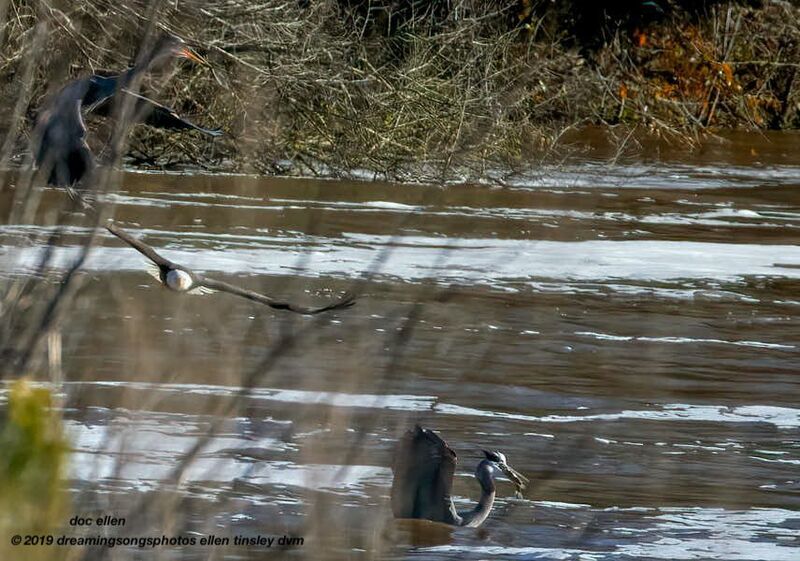 Each is certain that the other heron has the better fishing spot on the bank. 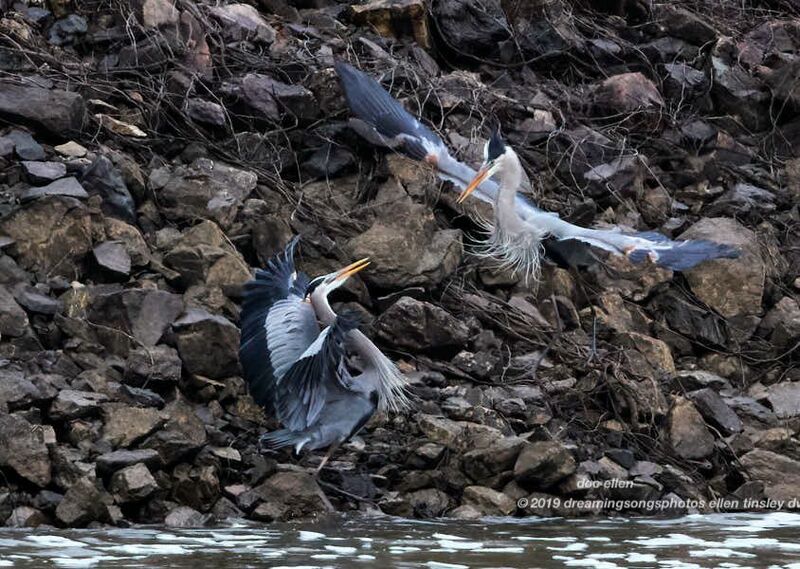 This fracas started on the shore of the Haw River, inside the riprap. The dam was stunning fish as they passed through the gates and the pickings were easy. Unless, of course, your neighbor heron was further upstream than you were and the fish passed them first. Both herons missed the fish and a third heron a little further downstream had it for breakfast. 1 medium-sized fish, stunned by the transit through the dam. 1 great blue heron with the fish in its beak. 1 great blue heron thinking about stealing the fish from the other heron. 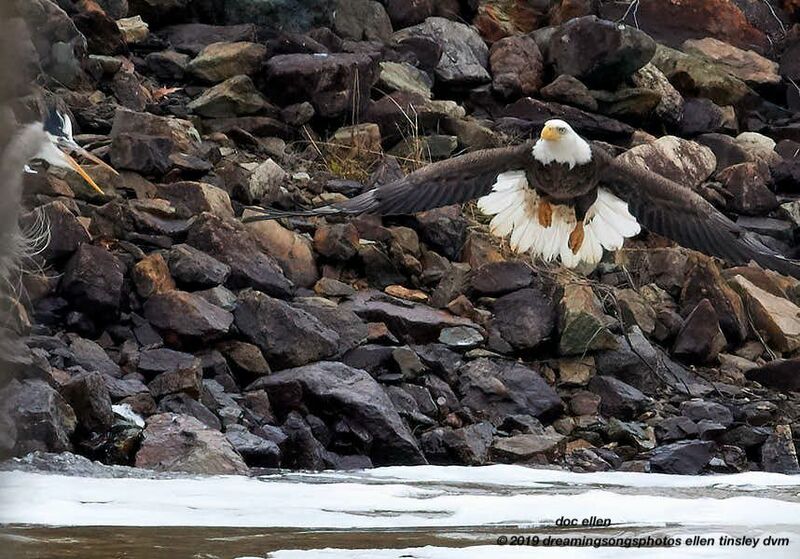 1 bald eagle determined to make the fish his. 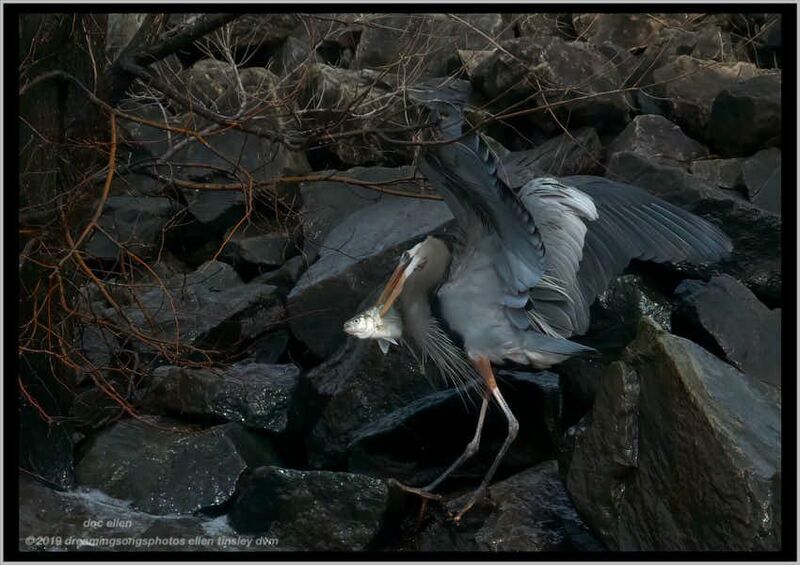 Results: the heron swallowed the fish before it could get stolen. The bald eagle was lined up, eyes steady on the fish. He had dropped his feet and was ready to flare his talons. I was hoping for a great photo of a fish catch. The great blue heron squawked, gronked, flared his head feathers and the eagle got distracted. 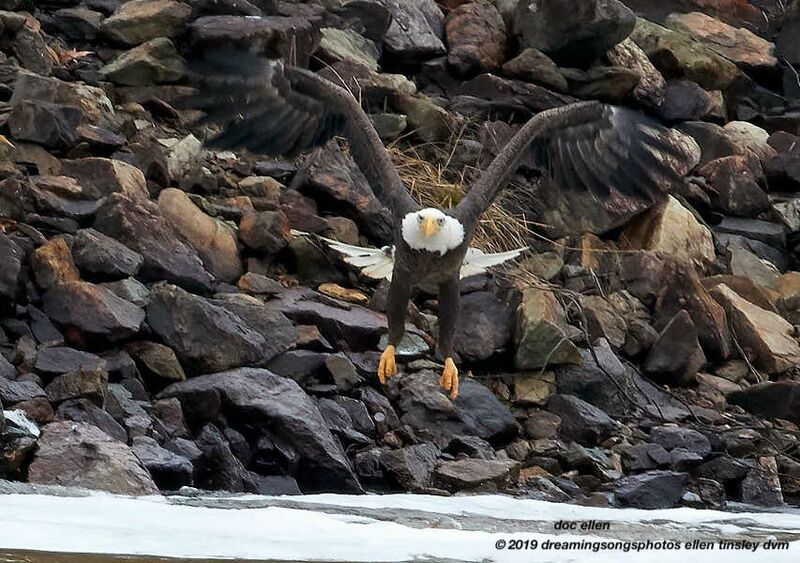 The eagle bent away from the heron, pulled up his feet and went around for another try. The look on the eagle’s face was priceless. 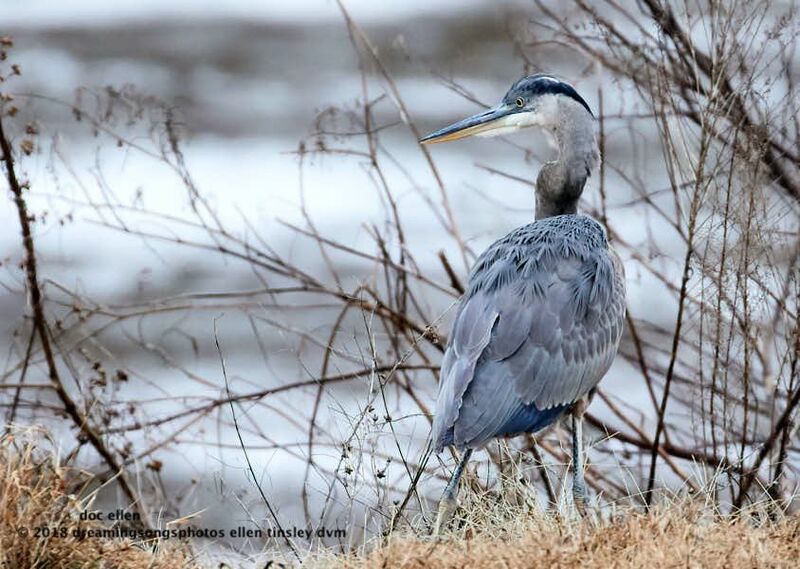 The great blue heron was standing on the fishing pier railing at the Jordan Lake Dam tailrace this morning. 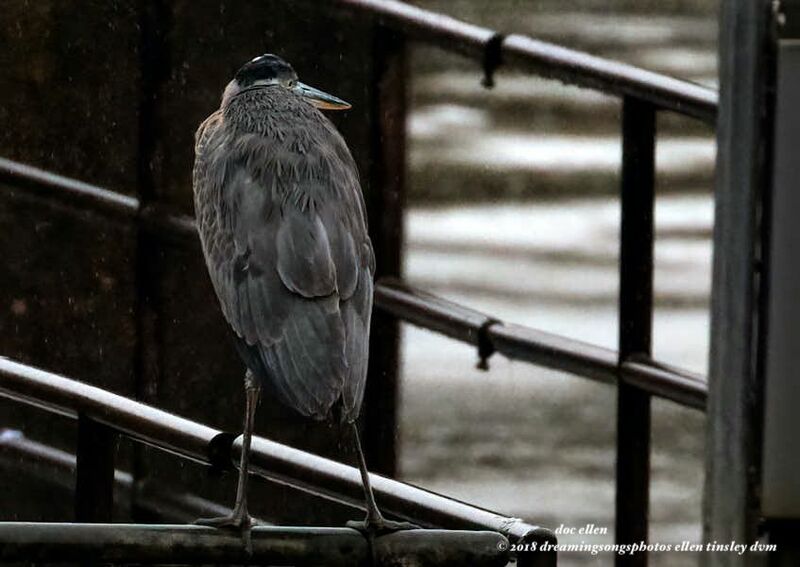 She was ignoring the rain but intently watching another great blue heron on the other side of the river. Good thing my camera also ignores the rain, but I do try to keep it dry. Now, as far as doc goes: my winter coat shed the rain and most of the cold, but I was happy to return to my truck after an hour or so. Well, grump, I have not been able to get to Jordan Lake since Saturday – even my truck with its 4-wheel drive is not up to navigating ice. So, I thought I would gather some of my photos of the week prior to the storm and try to bring some lake good thoughts to all of us!!! Here is an edition of my doc ellen’s Jordan Lake Neighborhood where I share some of the smaller, but as adored, birds with all of you. I surely hope to be reporting on eagles from the lake tomorrow! 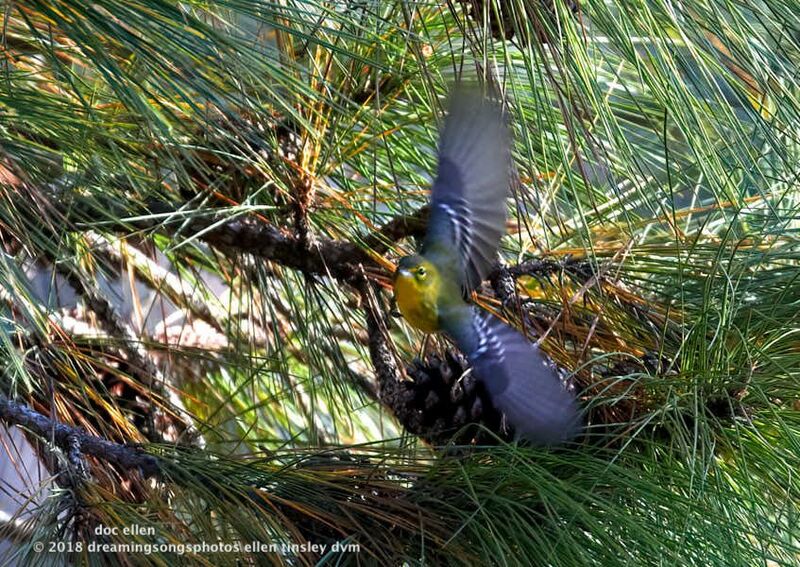 This pine warbler leaped toward me from the pinecone below him where he had been tearing pine nuts from the cone for a meal. 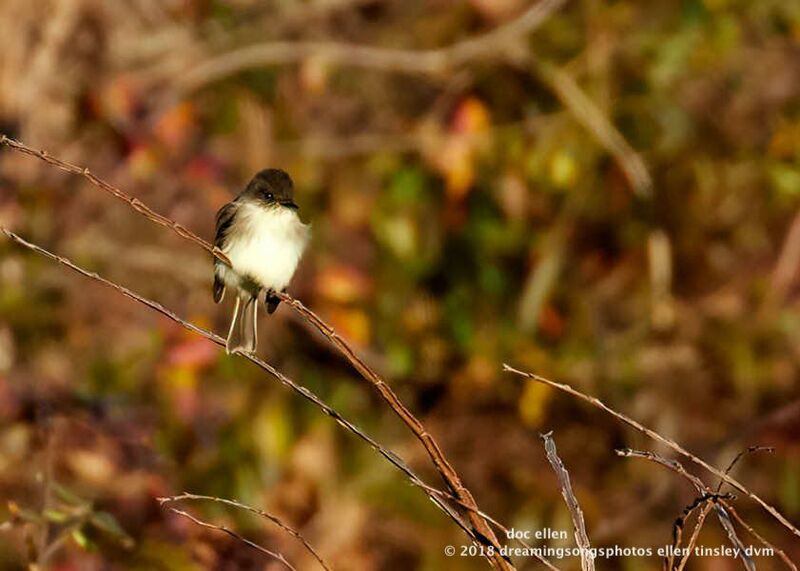 Eastern phoebes are slim flycatchers, but the cold wind had made this one fluff his feathers up into a warm layer. I grew up calling this bird a rufous-sided towhee – very appropriate for his plumage. 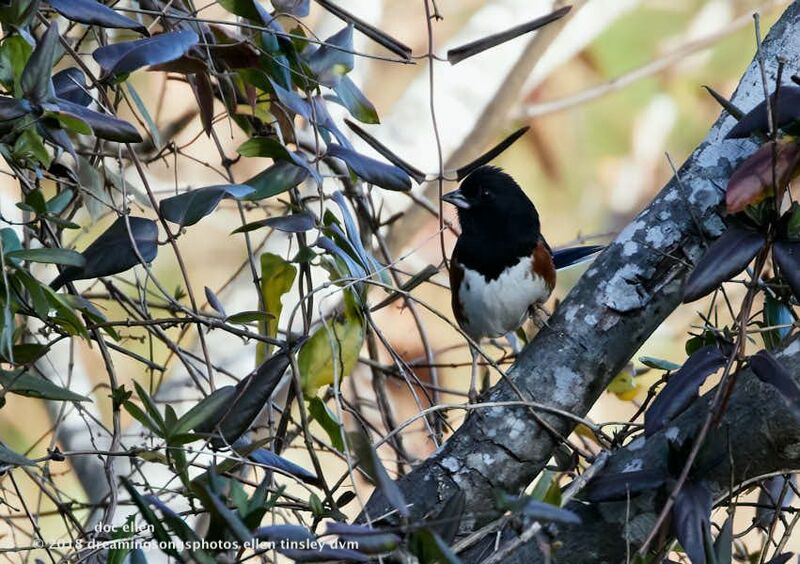 But, a few years back his name was changed to eastern towhee and this bird and the spotted towhee became a single species. 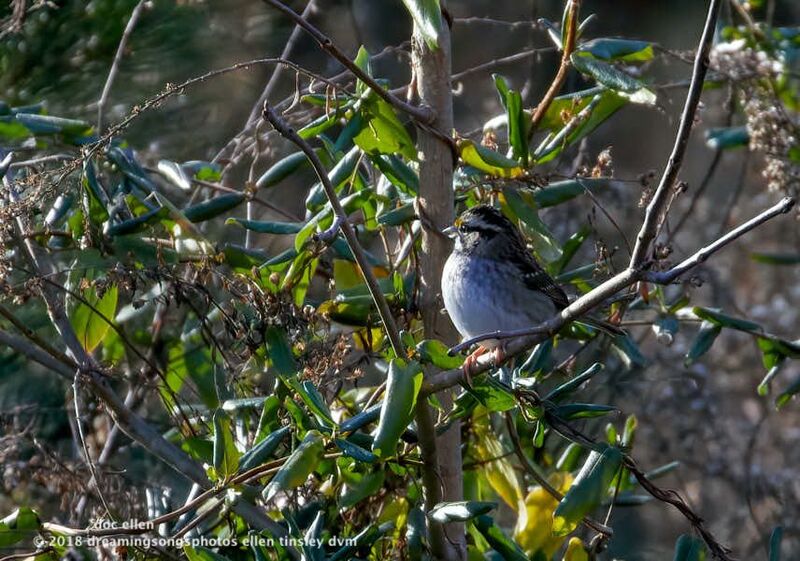 Quite a glint of sun on a cold morning in the eye of this white-throated sparrow. 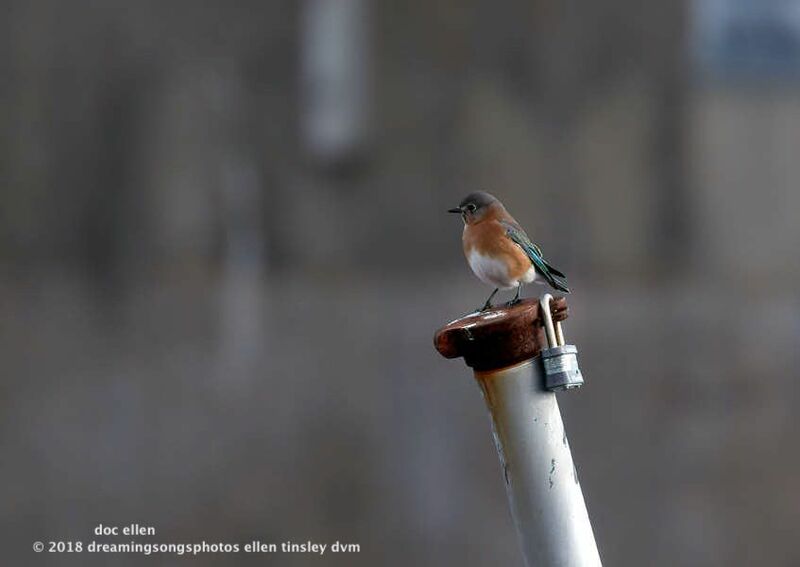 This eastern bluebird seems to be guarding the locked cap that secures one of the test vents for the dam. There is another great blue heron across the river (unseen in the photo). Herons are ever on the outlook for any intruders of their own species.